We did our first bike camping trip in April. Discovering new joy as a family, with friends and their families, while traveling by bike, to camp, has been a memory maker. 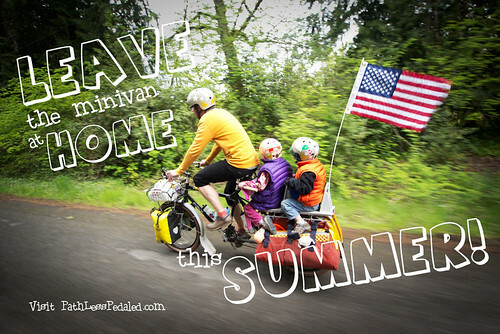 Sure beats the family vacations we had as a child, my parent’s never actually biked *with* us. Thanks for sharing, and inspiring more to do the same. I love the videos, it was a great trip. Ride by bike! Do you happen to have the lady with the green longtail’s website? Awesome! Where can you get the bikes with the built in kids seats at? Or are they custom made? Thanks!